Yeah, Democrats,Liberals ALWAYS hate the truth! Gotta protect Obummer and Killery! EDWARD I. from Terre Haute, IN signed. WHY DON'T YOU LAZY GOOD FOR NOTHING, PROMISS BREAKERS GET OFF YOUR BUTTS AND DO SOMETHING ABOUT THIS MUSLIM DICTATOR FOR A PRESIDENT AND IMPEACH THE S.O.B. HE HAS BROKEN SO MANY CONSTITUTIONAL LAWS IT'S REDICULOUS. HRC is a Pathetic human being . Peggy O. from Cleves, OH signed. Roger M. from La Crosse, WI signed. Jodi S. from Pasadena, TX signed. David C. from Richards, MO signed. Wirth C. from Irvine, CA signed. How is there even a debate on whether this committee should be shut down? We haven't even gotten all of the testimony yet! How could we when the administration puts a muzzle on all of the witnesses? We should not rest until the American lives that were lost get to see the people who are responsible get the justice they deserve, i.e., Hillary Clinton. 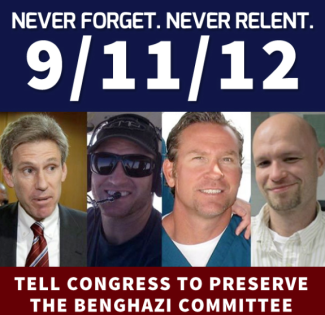 THE Benghazi AFFAIR WAS A TERRIBLE UNJUSTICE, DONE TO 4 GREAT AMERICANS. I CALL THEM GREAT, BECAUSE THEY GAVE THEIR LIVES FOR OUR COUNTRY. IF THEY GAVE THEIR LIVES FOR THEIR RELIGIOUS BELIEFS, THEY WOULD BE CALLED SAINTS. THE LITTLE COCKROACHES RESPONSIBLE FOR THEIR DEATHS, LIKE HILLARY CLINTON WHO NOW NOT ONLY IS RUNNING FOR PRESIDENT, SHE FEELS THAT SHE IS ENTITLED TO THE POSITION. VERILY I SAY TO YOU, THE ONLY THING SHE IS ENTITLED TO, IS A FIRING SQUAD, OR A HANG-MANS NOOSE FOR HER PART IN THEIR DEATHS, AND THE SUBSEQUANT COVER-UP. Trudy C. from Lucas, IA signed. Curtis C. from Henderson, NV signed. David W. from Martinsville, VA signed. Keep this committee active. There has to be much more that has not been revealed. All involved in this murderous coverup should be hanged for treason! Don't let Clinton get away with murder. Larry G. from Fremont, CA signed. james w. from Mechanicsville, MD signed. Say NO to Syrian Refugees. It doesn't look like "women and children first". Looks more like young fighting age males from what I've seen. Chris F. from Chandler, AZ signed. Robert M. from Jonesboro, LA signed. An attack on an American Embassy or Consulate is an attack on America. This could have been prevented but so far no public official has been held accountable. I want to know who is responsible, not for the "Lie", but for the incompetence an failure that resulted in the attack and the lack of security resources. Somebody must be held accountable and the public has a right to know who and what punitive actions were taken.